Found this excellent introductory article to the mindset behind conversion optimisation here and wanted to share it. It certainly isn’t the definitive piece written on the subject but offers both a nice intro as well as a perspective that is valuable when continuing the discussion internally. The goal of CRO is to increase the value per [whatever metric you are measuring]. For example, that could be the value per click, per subscriber, or per purchase. You go about this process by testing different variations of your landing page. Things like the headline, images, layout, button color, call to action, social proof, and urgency have some of the biggest impact on the conversion rate. And that’s where *most* people go wrong. And then randomly test anything that might increase those *vanity* metrics. This is as opposed to the correct way, where you optimize for key performance indicators like revenue/profit/value per subscriber. So you end up with newbie marketers that take their original landing page — which converted decently — and make the language extremely confusing, make the value proposition unclear… but throws in a higher contrast button, and more powerful (but not-relevant) headline, and more compelling copy (but to the wrong audience). What happens? You get ‘higher’ conversions but less value from your traffic. Optimizing for the highest opt-in percentage (or the amount of people that view/click on your sales page) is NOT the same thing as optimizing for KPIs. The former leads to lower profit, unless you get lucky, while the latter leads to more money in your pocket. You DO want more money, right? For a variety of reasons, I can’t teach you copywriting/CRO with one forum post. We will do this by understanding the “behind the scenes” part of conversion rate optimization. How do you come up with a killer offer? What problem does your website/product/offer solve for them? 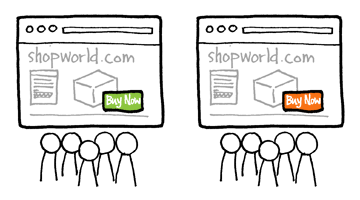 What result is the customer hoping to get from your website/product/offer? What timeframe are they hoping to achieve that result? What ‘barriers’ to conversion might there be? 2. They want to lose on average 15-30 pounds. 3. They want to achieve this goal in 3 months or less. 4. They don’t want to have to workout excessively. Now, let’s move onto the the rest of the landing page. Get The Attention – Arguably the most important part of a landing page… you need to get the attention of the ideal prospect for your offer. The headline normally accomplishes this.. but you need to really *hook* the reader in again and again throughout your entire landing page so they actually consume the copywriting that you put so much work into. Address the problem – What’s the *burning* pain-point your product solves? Who And Why – Make it very clear who will benefit from your offer — and why they should use you, specifically, over any potential competition. Clear, compelling benefits – The various lesser pain-points you are helping. Scarcity – People want what they can’t have. If you only have 20 seats on your webinar, it is much more compelling to join than having 10,000 open seats… because the resource isn’t scarce. If you only take on 1 client a month, that makes your leads try to “sell themselves” to you, so you’ll take them on as a client. The End – It is very powerful to end with a personal signature — like your name, or the signature you’d use for an email, make the landing page seem like more of a personal correspondence between you and the traffic. Also, make sure to include a postscript… they are one of the most-read pieces of copy… on emails/landing pages/sales copy. (e.g. “P.S. If you truly want to lose those last 10 pounds of belly fat, AND you are willing to put in the necessary dieting to make it happen… then you have all the more reason to sign up right this instant.”) I personally like to use post-scripts to reiterate the biggest/most powerful benefit or call to action, one last time. Remove all distractions – Your landing pages, by design, are created to acheive one goal. You want traffic to do *one* thing when they hit your page. So remove all navigation, or links that take them away from this one page. You want to keep all of their attention on the page, until they either convert or leave. Salutation – It is worth testing a typical salutation on your landing pages — meant to connect with your target audience. (e.g. If I’m selling to business owners, I might test a salutation of “Dear Innovative Business Owners,” or “Dear Small Business Marketer,”) Think of this like a greeting, but in written form, the same way you’d start a letter to a friend with a salutation (but normally that would be “Dear Friend,”). The idea here is that you are making the message very personal — less ‘salesy’ and more focused on problem-solving. Conversion optimization… getting the most money from your list… and creating winning marketing campaigns comes down to the offer — above everything else. Remember that you do NOT need any sly tricks, procedures, or strategies for boosting your conversions. First get the offer perfected, then move onto small optimization. Remember to optimize for back-end profit, or some other key performance indicator, do NOT optimize for the highest percentage of opt-ins or some other vanity metric unless you can correlate that increase to an increase in revenue/profit. Make sure that you are offering a compelling result/benefit/solution in return for your traffic completing the call-to-action. It is *that* simple. In essence, THAT is what you need to do to get killer conversions from your landing pages, squeeze pages, sales pages, etc. 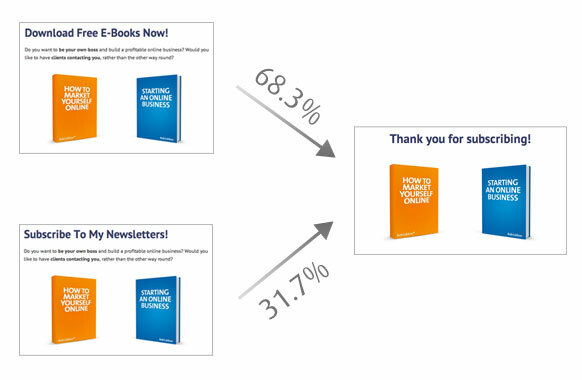 Be *so* compelling, that your traffic cannot help but convert. Here’s the idea: Mice have only two prime directives in life. To get the cheese and to avoid cats. To simplify: Mice only care about generating pleasure (getting the cheese) or avoiding pain (being eaten by a cat). Remember: Any time you are crafting an offer… think about the situation from the eyes of your readers. Answer the question: What is in it for ME? You make a compelling offer by offering SO MUCH VALUE to the end reader that they cannot help but convert. You make an offer that benefits THEM. Let’s see which elements of an effective landing page he is incorporating. Grabs attention through powerful headline. Establishes trust through personal picture, picture of book cover, and privacy statement. Believable – “This is a test. I’ve never put all this content online before….” He’s telling you WHY he’s making such a crazy offer… and it seem believable. Clean, professional layout – Does not distract from the one conversion at hand. Even uses high-contrast button and color scheme to make the call to action VERY apparent. Low Friction – Just asks for name + email in return for lots of value. The Mice Marketing Theory – Focuses 100% on the value to end reader, NOT what he gains from this interaction. It’s all about what YOU get for giving your email.